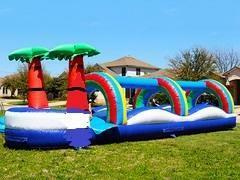 This paradise themed slip and slide rental is great for anyone ages 7 and up. It is 4' longer than a normal sized slip and slide. Great for any college party, apartment party, company party or any backyard party in general.